Preheat oven to 400°F. Cut each acorn squash lengthwise in half (from tip to stem) then scoop out and discard any seeds and stringy flesh. Brush insides of acorn squash with 1 1/2 tablespoons of the oil and season with salt. Place acorn squash, cut side down, in a baking pan and roast until tender but still firm, about 20 minutes. Meanwhile, start the risotto by bringing the broth just to a simmer in a small pot over medium high heat. Heat remaining 2 tablespoons oil in a heavy 3-quart pot over medium heat. Add leeks and cook, stirring often, until soft, about 5 minutes. Add butternut squash and cook for 3 minutes. Add rice and cook, stirring, for 2 to 3 minutes, or until grains are fragrant. Add wine and stir constantly until almost completely absorbed, about 2 minutes. Add 1/2 cup of the hot broth to rice and cook, stirring occasionally, until liquid is almost completely absorbed. Continue adding broth, 1/2 cup at a time, making sure that most of the liquid is absorbed before adding more. Continue until rice is almost tender, but still firm to the bite, about 20 to 25 minutes total. Stir in 1 tablespoon of the sage and season with salt. Meanwhile, put pine nuts into a food processor and pulse until coarsely ground. Stir in thyme, remaining 1/2 teaspoon sage and 1/4 teaspoon salt. Set aside. When acorn squash is cooked, remove from oven. Reduce heat to 300°F. Carefully turn squash over and fill each cavity with about 1/2 cup of the risotto. Gently press about 2 tablespoons of the pine nut mixture on top of the risotto in each squash half. Return squash to oven and bake until topping begins to brown, about 20 minutes. Transfer to plates and serve. 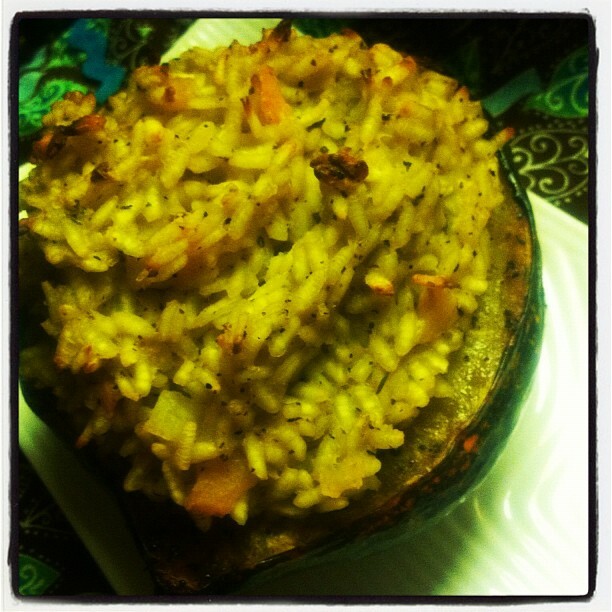 P.S...I now know I like acorn squash!